The 7th birthday of Ahmednagar Child Line was celebrated with enthusiasm and optimism yesterday. Snehalaya is the collaborative organization of the child line at Ahmednagar. 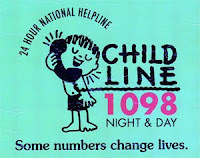 The toll free phone number 1098 is hope for homeless and exploited children in trouble. During the last 7 years, the Snehalaya Child line team , working 24 x 7 has received more than 3 hundred thousand phone calls. The team has handled more than 12 thousand rescue cases of children in distress and has rehabilitated them. The team has also exposed hundreds cases of commercial sexual exploitation and trafficking over these years. To mark the occasion, Child line team organized health camps in Slums treated about 1500 children. Mr. Sudhir Mancharkar, District Women & Child Welfare Officer, Mr. Satish Kane, senior journalist and editor of 60 years old Daily Samachar, Mr. Ashok Mule, Convener Swadeshi Jagran Manch, the members of the child welfare committee & Junevile Justice Board, representatives of various organizations working for women & children in distress admired and honored the Child Line team for its pro-active efforts with risk and complete dedication in solving the sensitive issues related to children. Mr. Mancharkar said that, he has worked many places in Maharashtra as a district woman, child welfare officer. But Ahmednagar Child Line is different in character and results. The use of children in flesh trade and other types of victimization of children is stopped in Ahmednagar District due to the efforts of child line. We expect and want the protection of child rights, as it's a basis of our nation building. But without the involvement and initiative of the civil society and the NGO's it is merely not possible to the Government, the Police, the media or Judiciary. The Child Line has involved the civil society in the process of the protection of child rights and created the difference. Mr. Kane congratulated child line for its initiatives in various cases and the role-played by child line volunteers as complaint, witness etc. He said, many people are working for children as it has became a fashion. But the child line team is working with passion. Child Lind ha brought the real and sustainable change in the lives thousands of under privileged children. Mr. Rajendra Shukre, the Honorary Director of Ahmednagar Child Line explained the information about the cases handled in the last year. "We have made the systems of Government, NGO's, CWC, more child friendly than the past. Reached to 35 thousands children in Ahmednagar with information of child rights and child line." Mr. Shukre added. Mr. Dattatray Panchal, coordinator offered the vote of thanks.